You can purchase the Kids' Wings 12-page literature guide for Mommy's Best Kisses, the 16-page guide for Nightsong, and the 9-page guide for Song of the Night. 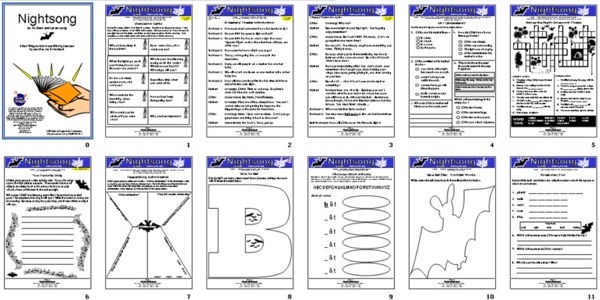 Download all 37 pages of activities for only $16.95! Sharable within your school! Click here to purchase and download. 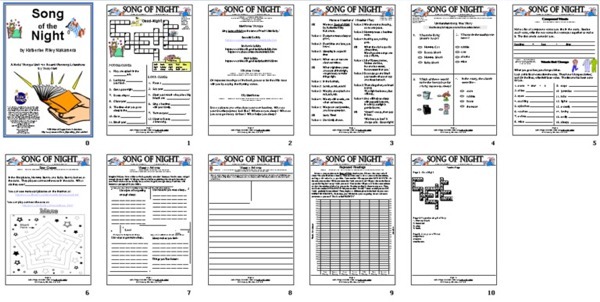 You can purchase the Kids Wings guides for Nightsong PLUS Bats at the Beach and Loren Long's Otis all in the same 45-page download! Immediate download! Only $12.95! A mother bat prepared her baby bat, Chiro, for his first solo flight. She assured him that she would be waiting for him inside the cave. Chiro was worried. How could he see in the dark? How would he find his way in the world? She whispered reassuring words, "Sense is the song you sing out into the world, and the song the world sings back to you." What did she mean? How could he just drop into the dark and be safe? Chiro did as he was told and as he flew, he sang. What do you think happened? Was he able to find his breakfast? Did he find his way back home? Was his mother waiting? In Nightsong, you will be introduced to echolocation, the secret sense that only bats have. In the poetic prose of Ari Berk and the precious paintings of Loren Long, you can follow Chiro's first night on his own and, in the process, possibly discover the song you will sing out into the world as you grow up. A beautiful, touching story with vocabulary and syntax that will inspire awe in every reader. Willie Nelson's Sing-Along Song: "Blue"
Johann Strauss II's classic "Die Fledermaus (The Bat) Overture, Op 362" is our background music. 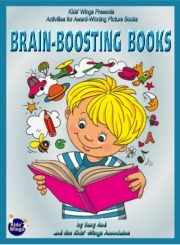 A 16-page literature guide, perfect for lesson plans, handouts, or projection on your electronic board for Nightsong is part of the 2013 Literature Collection, Brain Boosting Books! in the Kids Wings collection of award-winning books, now on sale!